In my last review featuring Halloween Man, it was my first time ever hearing about the character and I enjoyed him enough I stated that I would love to see more from him. In what feels like a Christmas miracle, today I was able to do just that with Halloween Man: Christmas Special 2017. And while Holiday specials are not generally where more people go to get quality stories, it has been a pleasure knowing that these 2 I have read have been pretty solid. The Christmas Special isn’t perfect by any means, nothing is, but it’s very enjoyable. It tells two indistinct, short tales that fly by fast but also manage to have heart and humor in them. 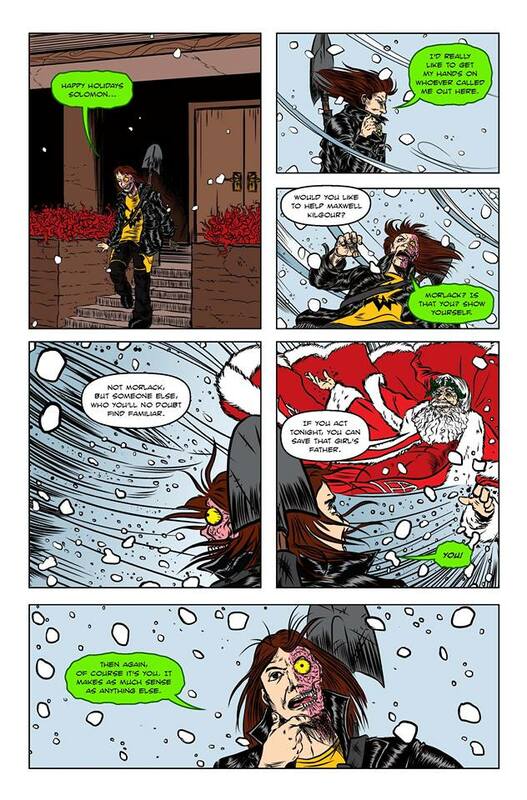 The first story features Halloween Man himself in taking on a job for Santa Claus in hopes of saving a man’s soul from what looks to be Fairy hell. There is no reason for Santa to want to do this other than to do something nice for someone on Christmas day, and I think that’s great. What HM finds down there is quite a bit of fun and I hope the Fairy afterlife makes a comeback eventually. I won’t spoil how things go down, but there’s a lot of heart in this story even if it is inconsequential. The art for this for story is cartoony and colorful. 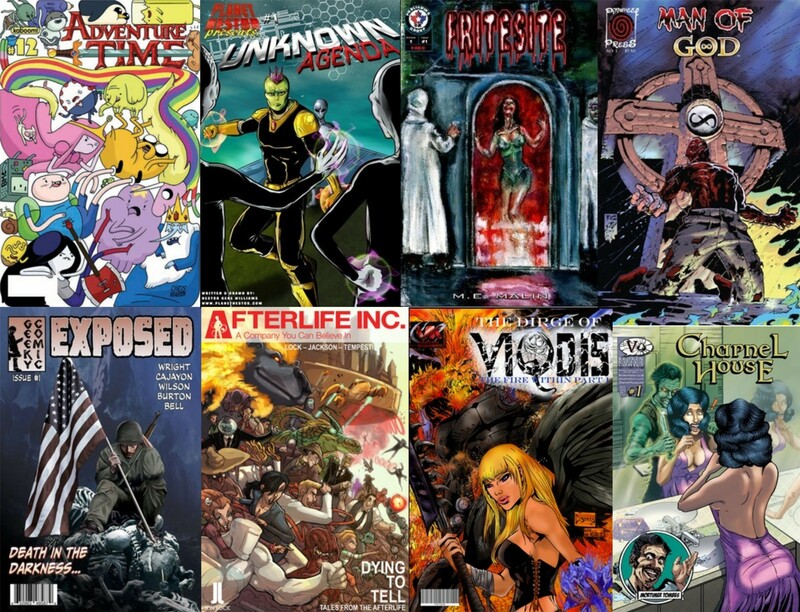 It has a sense of kinetic energy during the fight scenes and the afterlife designs are a whole lot of fun. 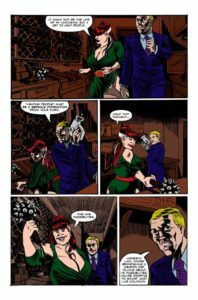 In the second story Lucy Chaplin, another character in the Halloween Man lore takes center stage. This was the one that through me off the most as, again, I’m new to this world and I also failed to read the blurb at the beginning of the book about her being HM’s girlfriend. Despite originally seeing this as a random second story at first, it never once stopped me from enjoying the story in full. I love the character of Lucy and her sidekick this episode, as well as the villain they encountered. There was just something inherently fun and even slightly heart tugging at the end of the story. I assume it’s a moment built on past publications of these two characters, but it felt natural rather than forced. I won’t say what it was, but the ending does pull at the heart strings a bit. And the art for this story was more on the realistic side but never lost its sense of charm or fun. 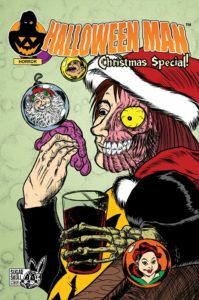 Overall, Halloween Man: Christmas Special 2017 is a solid read despite not being exactly new reader friendly. I recommend it for a good, holiday, popcorn fest. It’ll take you maybe a few minutes to read it but it’ll be a good few minutes well spent. Have some fun, read something you don’t have to take too seriously for once. And Merry Christmas! Editor’s Note: Head right here to find out where you can grab yourself a copy! Summary: This Christmas, Halloween Man ventures into the underworld to save a soul just in time for the Holidays. And while that’s going on Lucy Chaplin is in the fight of her life as she battles the enigmatic Frontier Phantom! 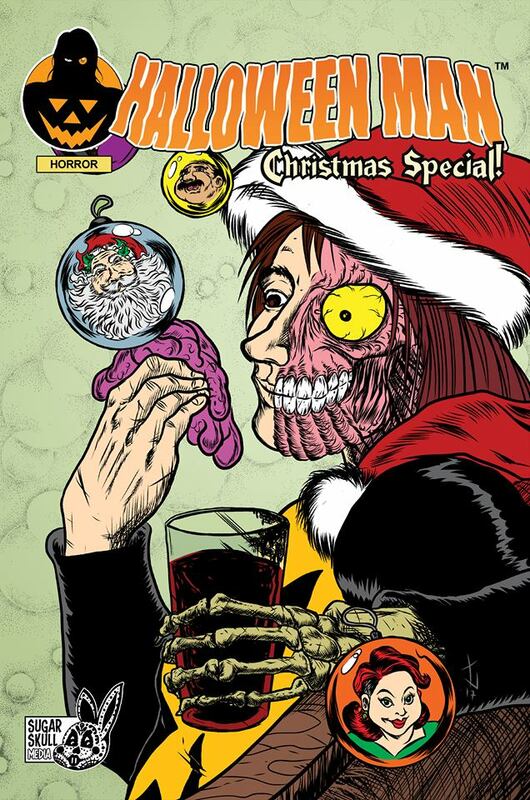 Tags: April Guadiana, Dan Conner, Drew Edwards, Halloween Man does Christmas!, Halloween Man: Christmas Special 2017 [One-Shot], Indies, James Figueiredo, Jamie Bahr, Kevin Richardson, Lucy Chaplin and the enigmatic Frontier Phantom!, Santa Claus' very special job for Halloween Man!, Small Press Love, Sugar Skull Media, The Fairy Afterlife, This might pull at the heart strings!, Underworld journies!